Every six months or so, I get a bag of clothes from my old piano teacher. Well her daughter, I mean. . . *dreamy sigh* Oh it’s like Christmas. Anyhow. Sorry, got distracted for a second. I never wait until we drive home before I’m tugging out tops and pants and. . something that looks like an apron and arranging them around the dashboard of the car. I’m just not that patient. So, after they’re all set out, I go back to the pieces I really really like and examine the pieces that I’m confused about. Like the apron thing. It was like a thick Hawaiian-design, spaghetti strap. . mistake. 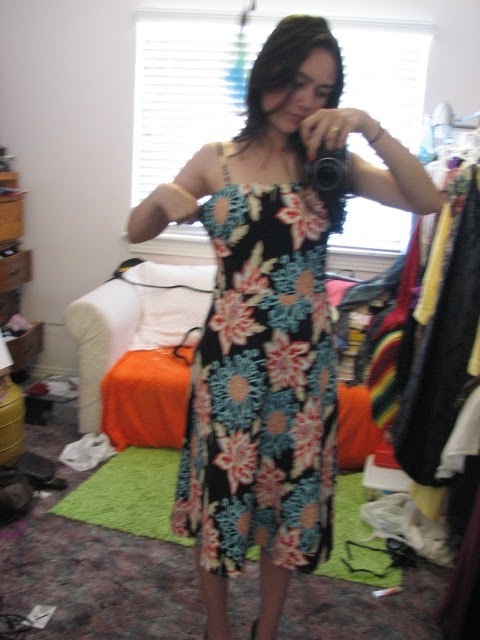 But when I got home and slipped my arms through the straps, I realized it was a dress. For some random reason, someone ripped the seams all the way down the side of this one dress. Poor little thing. So it looked like some strange apron. But hey, they were just the seams. I figured I could sew them back together. How hard could it be? I don’t know if I’ve mentioned this. But I’m somewhat terrified of my sewing machine. It tends to eat up my fabric. No seriously. Like, all the needle is doing is pushing the cloth deeper inside the machine (like a tongue) and tearing it up by doing so. It ruins all my cloth. So, I believe my fear is very valid. No teasing allowed. But nevertheless, I faced the great evil sitting on my bedroom desk. Thinking back, I don’t remember it eating the fabric, but it did mess up on the bottom of the stitch, making a long line of tangles. But who’s to know, eh? So I tried it on. My sewing wasn’t exactly straight so there was a bump/puff in the seams, but you can only see it if you’re really looking so it wasn’t that big of a deal. My bigger problem was the armpit/bodice area being too big that it puffs out on the sides. This is actually becoming a common problem with me and my figure type. So another go with the sewing machine would be required if I was going to wear the dress as is, or else I’d need an undershirt (which is what I ended up doing the first time). Otherwise, it’s a great dress. 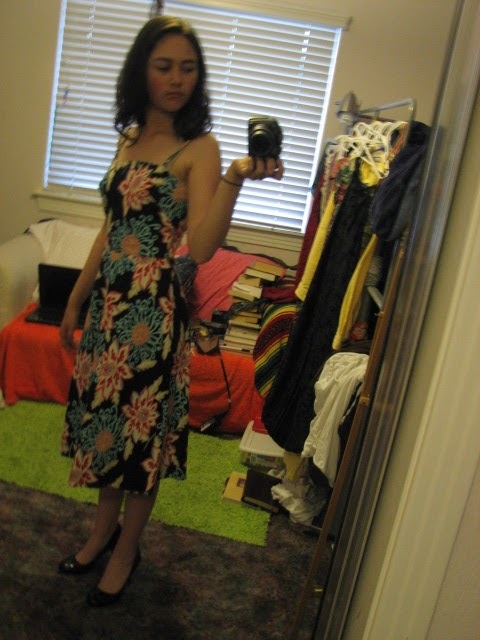 The length is perfect, the neckline is modest, and it fits snugly on my waist. Just comes to show, fear isn’t your friend when it comes to creativity. Huh, that should’ve been my title, don’t you think? 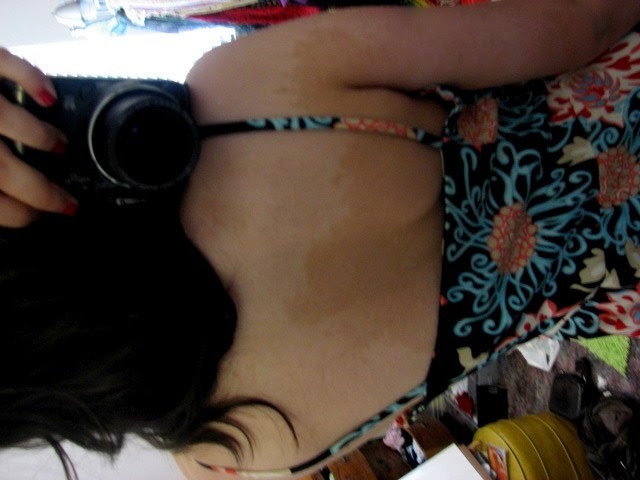 just a birthmark. Pretty sweet, eh?